When we experience life most intensely, there is richness, a sense of color and of detail -- as if everything about you is alive. Standing in the sun and having the full spectrum of light give everything dimension and strength has come to mean those moments of great life experience. Using the full spectrum of light to see color and detail no longer has to be an experience of the great outdoors. Now you can bring it to the factory floor the university/research setting or the industrial manufacturing facility. From quality control to product development, from cost reduction to increased productivity, full spectrum light, that captures the same range of light frequencies as the sun, can now be your greatest facility resource. 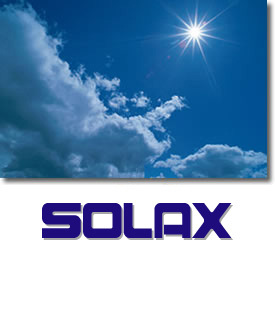 Welcome to the Solax Website, a place to find the latest information, products and service for industrial and research applications of natural light. As you review these pages please feel free to contact us to find ways to make your business manufacturing agricultural, scientific or academic project more productive.